Creating the perfect backyard space is exciting! There are as many different creative designs, options, and ideas as you and your design team can imagine. It’s important, however, that you take advantage of the right technology to effectively communicate that vision. 3D design is a useful design tool that allows you to do just that. While most design teams offer hand rendered or computer rendered two-dimensional models of your landscape design, many also offer the option to transform their clients’ designs into 3D computer generated models. Using accurate, to-scale reproductions of your house, yard, and even furniture elements and plant life, a 3D model can bring your vision for your landscape to life. Now, instead of your design team attempting to relate important design choices on flat paper, your team can demonstrate every aspect of the plan with a life-like proposal, customized to your exact needs. The models are beautiful and communicate your vision clearly, relieving fears and giving you that extra sense of excitement before a big project. 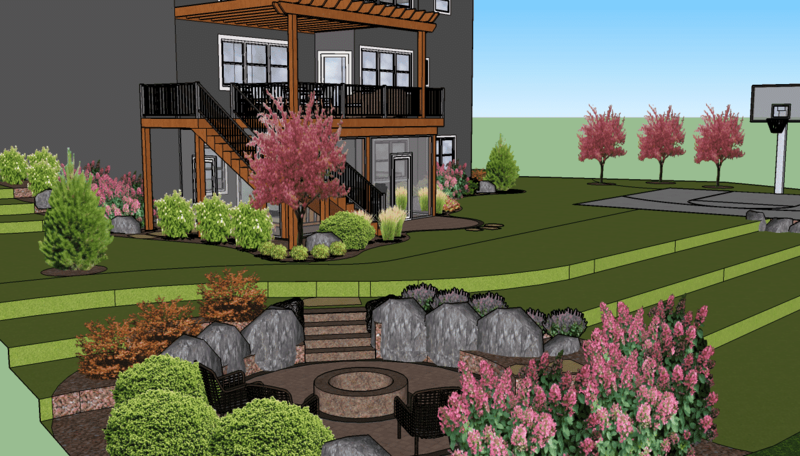 3D design is the newest and arguably best innovation to landscape design in recent years, and its benefits to homeowners are extensive. It has a clear advantage over traditional 2D renderings, which can be hard to follow or fully grasp. When you’re undertaking custom or complicated projects, it’s essential that your design team can communicate their inspiration to you, and it’s vital that you feel confident and enthused by what you see. Design teams love to watch their clients’ eyes light up when they see a 3D model, but the models also offer some incredible benefits. Not only do they help to ensure that you and your designer are on the same page, but they enable you to foresee the finished product. Communication is always a priority when working with a team to upgrade your home, and with 3D modeling, there’s no guess work. It’s also a fun opportunity to share sneak peeks of your upcoming changes to your friends and family! Most importantly, 3D models give you the gift of certainty. There’s no attempting to visualize complicated design architecture. Instead, you know exactly what you’re getting. This imparts tremendous relief to homeowners who trust their designers with their homes, budgets, and backyard dreams! Design teams also love 3D models. Thanks to their accuracy and built-in features, designers can quote projects much more accurately. This passes savings along to all involved (especially the client!) and ensures fewer last minute cost increases or project delays. Efficiently coordinating all individuals and supplies enables your design team to better focus on what matters: the outcome of your project. Ultimately, 3D modeling enables your design team to make sure no detail goes overlooked, a huge step up from 2D models. It also allows your team to make sure your outdoor area is exactly as you expect. Design changes happen quickly and efficiently, and client upgrades and customized options are presented with just a few clicks. Clients love to see multiple options for their backyards, and where these options used to be time-consuming and difficult to model, they now involve just a few clicks. Imagine being able to envision yourself in your backyard, before the work has even begun? That’s exactly what 3D modeling brings to the table! Not every project requires 3D modeling, but it’s a huge benefit that more and more design teams are offering their clients. 3D modeling brings an extra level of customer satisfaction to backyard design projects while reducing timeline delays and unexpected costs. It’s an innovation that results in the best possible experience for all involved, a true marriage of form and function!